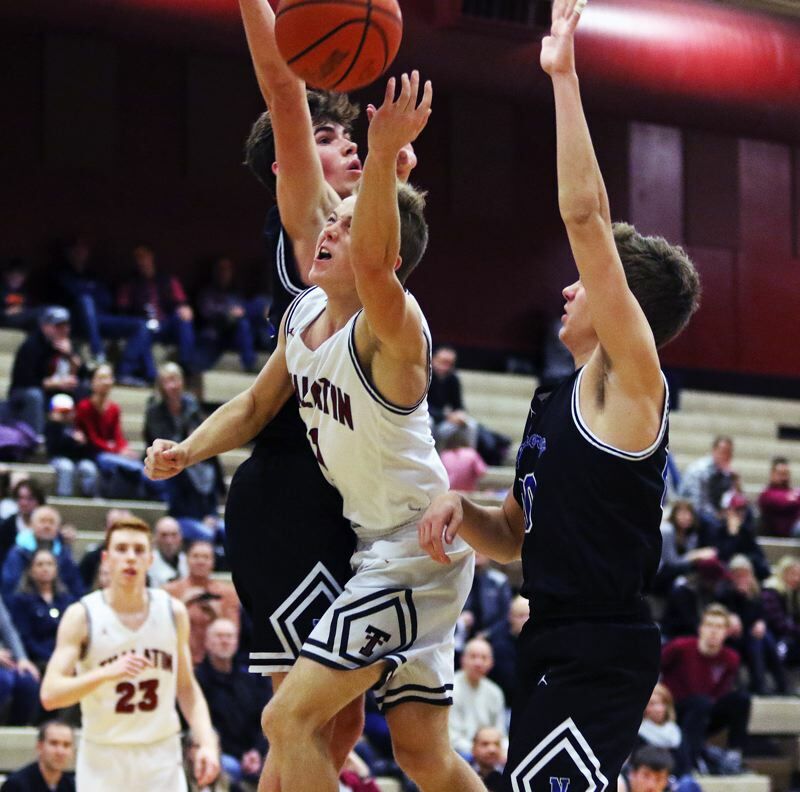 Time after time, the Tualatin High School boys basketball team battled the top squads from the Three Rivers League tough. But the Timberwolves didn't have a win over those top teams — until Friday. And, what a win it was. Tualatin, which had previously lost close games to West Linn, Oregon City and Tigard, powered its way to a 67-60 win over Lake Oswego (which entered the game as the No. 1 team in both the Class 6A coaches poll and the OSAA power rankings) in a Three Rivers League game played at Tualatin High School. "That was pretty big," Tualatin coach Todd Jukkala said. "We had played so many close games. We kept telling ourselves, and the kids, that if we stuck to our plan of improvement, it would pay off. We just weren't sure that it would be in this game. But they have just kept playing hard, and they competed." With the loss, Lake Oswego moved to 6-1 in TRL play (15-4 overall), dropping the Lakers into a tie with Tigard for first place in the league standings. Tualatin improved to 3-4 in TRL games (11-7 overall), putting the Wolves in fifth place in the league standings. "It was important for the kids to see that their hard work was paying off," Jukkala said. "Hopefully, we can keep it going." Senior guard Caden Dickson led the offensive attack for the Wolves in the victory, scoring a 26 points. "He hit some big shots," Jukkala said of Dickson, who also had four assists. Junior John Miller scored 13 points, but, maybe more importantly, with the help of junior Sam Noland and senior Jason Wisler, he helped limit talented, high-scoring Lake Oswego senior Josh Angle to 15 points. "John did a great job on defense," Jukkala said. "He's taken up that challenge all season." Senior Jack Rose added 11 points and six rebounds for the Wolves. Senior post Bridger Steppe had a strong offensive game and Tualatin also got a spark off the bench from junior David Ulwelling, who scored five points. "Defensively, we had a game plan, and we did a good job sticking to it," Jukkala said. The Wolves will be back in action on Friday, when they play at West Linn in a TRL game starting at 7 p.m.